There are lots of different ways to make faux hamburger cookies, but Laura's new tutorial is quick and easy, using all store bought ingredients. They would be a fun food craft for the kids to tryout this summer. 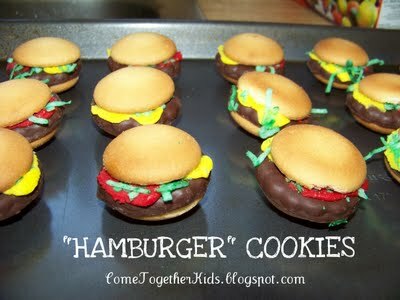 You can see how to build your own cookie burger over at Come Together Kids. Jolie passed these out to her class on April Fools day, with sesame seeds sprinkled on top. They were a big hit!